Over the past couple of weeks I needed 3 baby gifts, two for girls and one for a boy, so I decided to make some tag blankets. I already had one for a boy, which you can see here, so I only needed to make the two girl ones. 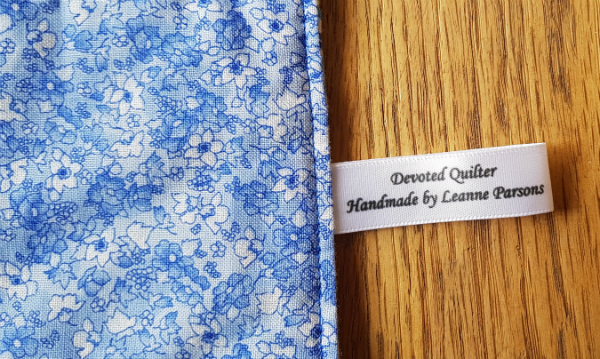 I had a charm pack of beautiful, feminine fabrics that I won from Sandra at Musings of a Menopausal Melon during the most recent 30 Quilt Designs challenge, so this seemed like the perfect time to use some of them. I love that they're very girly, without being pink or purple. I do love both pink and purple, but sometimes you want something a little different, especially since almost everything available for baby girls is one or both of those colours. 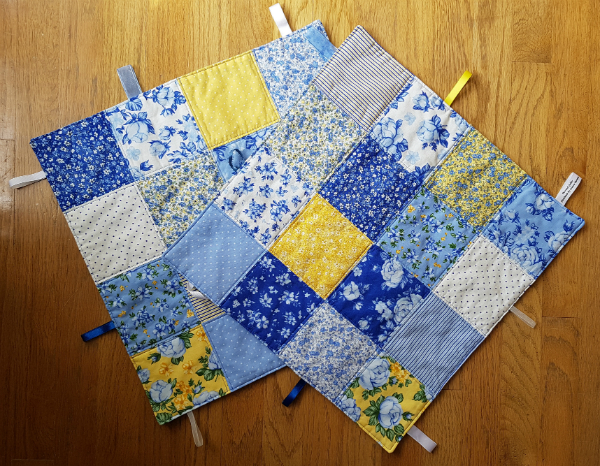 I used 16 of the charm squares for each of the blankets, sewn in a simple 4 x 4 layout. I stitched back and forth over each ribbon a bunch of times to make sure they'll hold up to being tugged on repeatedly. It was fun to add my label as one of the ribbons! 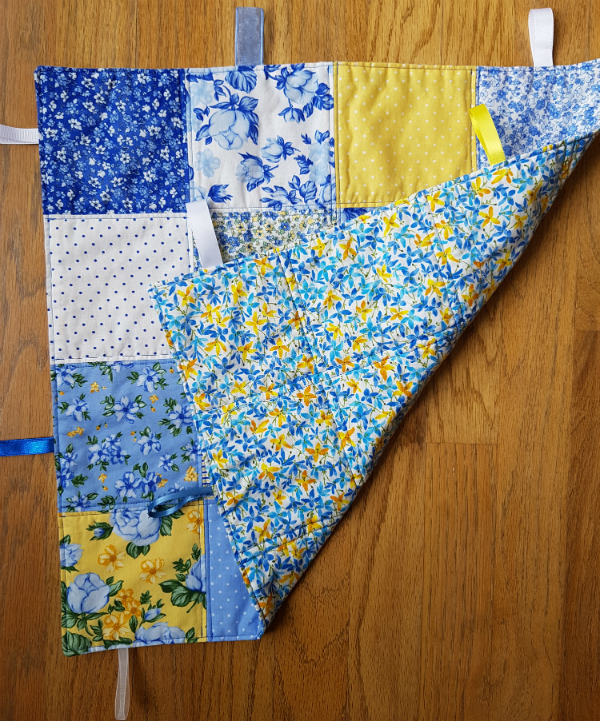 I had this fabulous blue and yellow floral in my stash that worked perfectly for the backing. It was just barely enough. 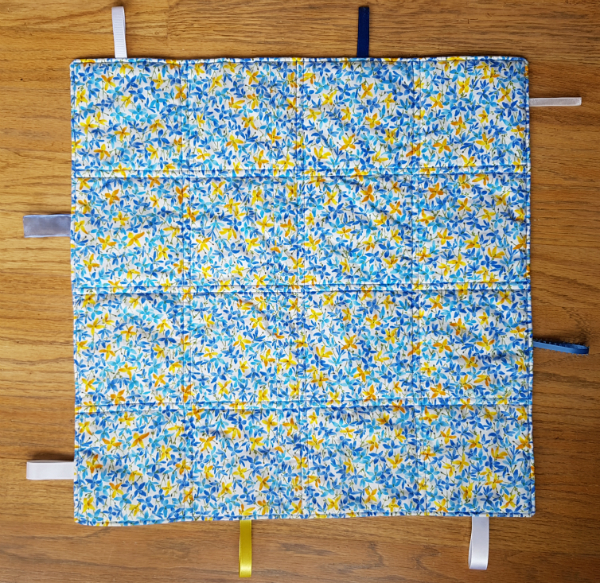 I even had to piece one of the backings and it ended up taking three seams to make it big enough. I used some of the Hobbs Thermore batting I got in my Island Batik box. 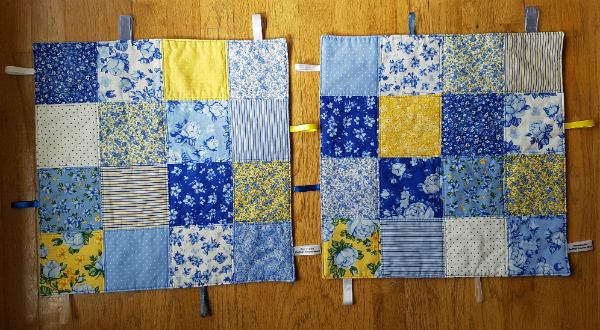 It's super thin, which I wouldn't want for a normal quilt, but it was nice for these. 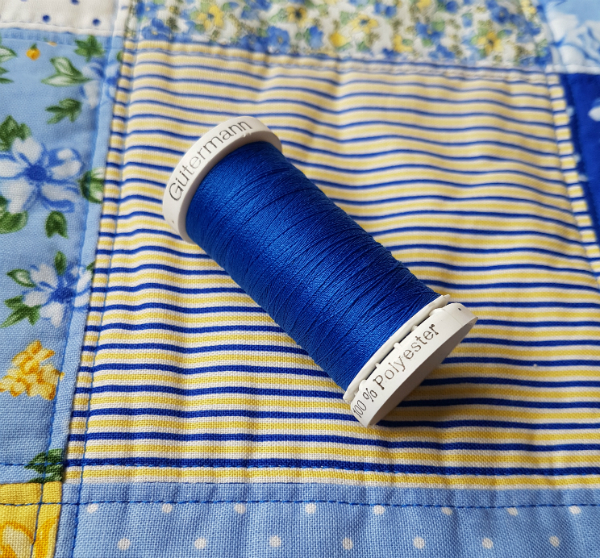 Now he loves to hear when I'm using the thread he gave me, so it was nice that it works perfectly with these fabrics. I stitched around the edge of the blanket to close up the hole I used to turn it right side out, then stitched on either side of each of the seams. Quick, simple and pretty! 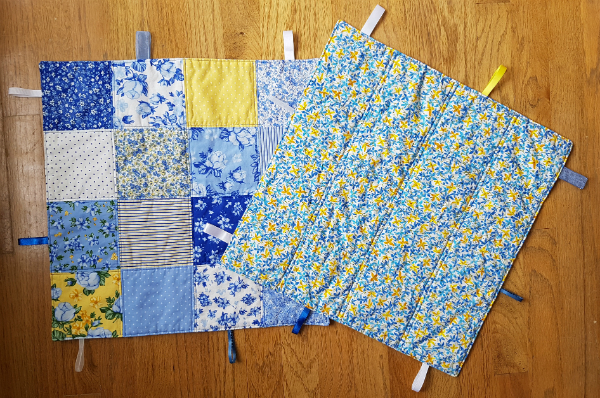 These are a nice, quick baby gift, perfect for when I don't have time for a full baby quilt. 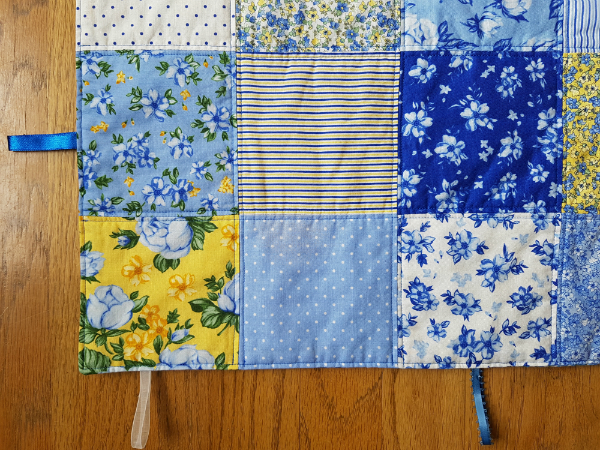 What's your go-to handmade baby gift that's not a quilt? I'm commenting first so I'll be sure to see your comments. Still hoping Blogger fixes this issue soon. Perfect gifts for baby and the yellow and blue really looks lovely together. Well, I usually made a small diaper bag for a quick gift. Leanne, I love the story of your thread. When the kids pick something out that they are excited to give you it just gets me. I can imagine his satisfaction at seeing you use and appreciate his gift. He sounds like such a sweet guy. This is a test comment to see if the fix for the comment problem worked. Fingers crossed! These are so cute. I've never made one, but definitely need to give it a try.